The Tektronix FG502 Function Generator Plug-In provides low distortion sine, square, triangle, positive and negative pulse and ramp waveforms. Frequency range from 0.1 Hz to 11 MHz. 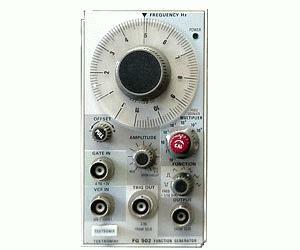 A voltage controlled frequency (VCF) controls the output frequency from an external source. A +2.5 V square wave trigger is available at the front panel and a variable DC offset of ±5 V is also provided.